San Francisco happens to be one of my favorite places to visit. It’s like no other place, the sites are unforgettable from every angle of the city and of the bay. The history of the buildings is fun to explore as you discover the architecture. I shared with you a few months ago that I got the chance to escape for the week with my husband to this famous area. Here’s our visit to Half Moon Bay, trust me a place you’ll want to visit too! Here are a few spots if you’re in San Francisco you don’t want to miss. I’ve linked them up to their destination sites for easy reference when you’re picking a location to visit. Many are free, we also used our complimentary CITYPASS to visit quite a few of our favorite spots! I was lucky enough to have the opportunity to stay for the weekend in a very special hotel with my husband. 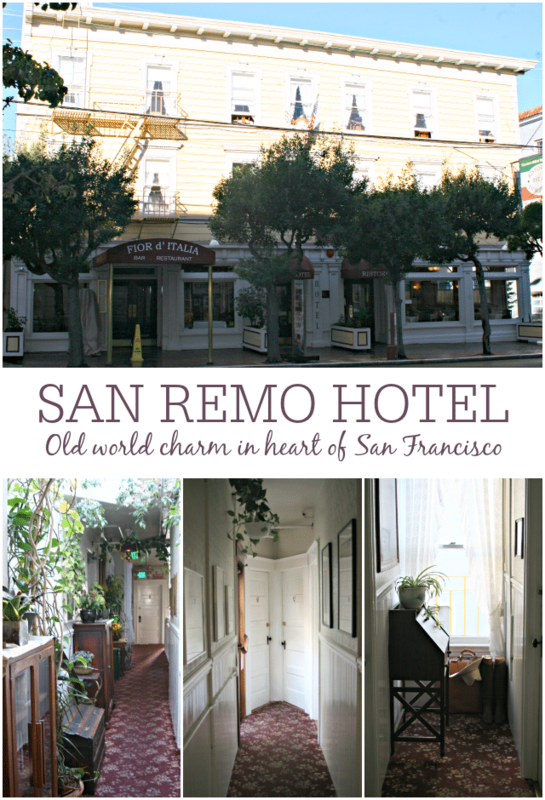 We were invited by the owners, brothers Tom and Robert Field, to the San Remo Hotel on Mason Street in the local North Beach Neighborhood. Built after the famous earthquakes of 1906, it’s a famous Victorian Style Hotel with unique charm. It’s not very often when you can feel like a part of a community while on vacation but this spot does just that. Plus it was so convenient to everything near Fishermann’s Wharf and Pier 39 we could walk everywhere! San Remo Hotelhas this unique Old World feel to it with Victorian Heirloom furnishings and hallways that are a walk through history with pieces hand selected. You can tell that the owners put great thought into it as they renovatedit. Every day we started bright and early and were out the door for our next adventure walking down to the bay, the Cable Car or the Sight Seeing Buses, so convenient! The hotel staff was so welcoming no matter what time you passed by the front stairway to head to the street you were greeted with a friendly smile and hello. There’s no technology in the rooms just charm and history and a fun way for couples to reconnect and share your favorites from the day’s adventures. We had never stayed so close to the San Francisco Bay before and were pleasantly surprised with how convenient it was to be there without a car. 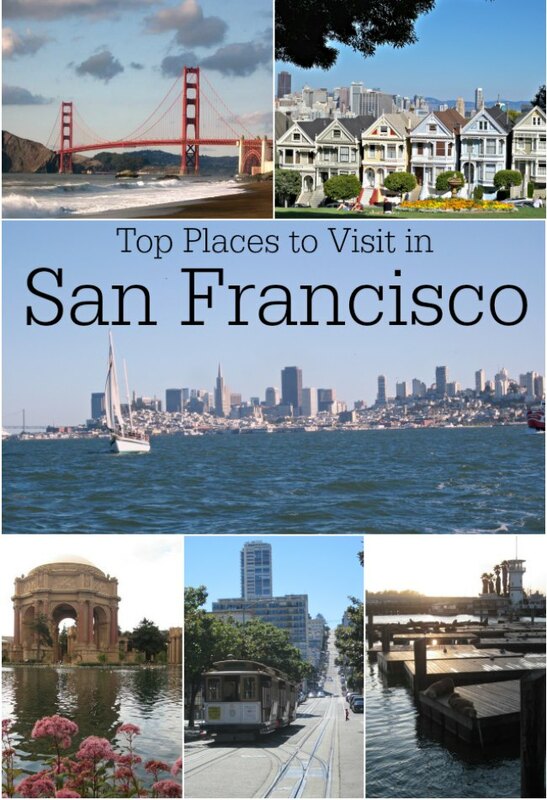 The City of San Francisco Visitors Bureau was very welcoming to their city with a top notch website that makes finding just the right spots to visit easy to find. Here are some of my favorites that we were able to walk to from our Hotel quite easily. One of the best things we did was use our Pass to the City SightSeeing San Francisco Tour Bus. We appreciate that they extended a media pass to us to explore how their tour bus line works. Before on my trips to San Francisco I had always driven the city and had honestly no idea what I was missing by handing over the steering wheel and enjoying the ride throughout the city. The next few days we explored around the San Francisco Area even more. These are some of my favorite places to visit. Are you ready to schedule your trip! What place would you visit first in San Francisco? Coming soon…. Places to Visit in Downtown San Francisco and a few fun kid bloggers I got to meet with while I was in California! Did you read about my Trip to San Diego? Follow The Educators’ Spin On It’s board Places to Travel and Tourist Spots to Visit on Pinterest. Disclosure: This post was not sponsored. We did however receive a complimentary stay at San Remo Hotel for two nights. The San Francisco Visitors Bureau gave us complimentary CityPASSes, Pier 39 Passes and City SightSeeing Tour Bus passes. All opinions are 100% my own and my husband’s and our many travels to the bay area.